What is it about bookmarks that have forever been so attractive to children? Do you know these languages? Maybe it’s their size – a bookmark is easy and satisfying for small hands to hold. Bookmarks are practical; they help us keep and find our place in a book or any other printed material where we almost ceremoniously tuck them between pages. Surely the colors in professionally printed bookmarks are eye-catching as is the huge variety of bookmark designs. Every book fair I have ever attended includes bookmarks for sale. More affordable than many books and more durable than one might think they would be, bookmarks are treasures that link children to the pleasures and benefits of reading. Like every other piece of education-related merchandise, store-bought bookmarks follow popular trends. Remember bookmarks featuring Wishbone, the dog whose adventures in books and on PBS television were created by Susan B. Chick and Vincent Brown? The original Wishbone TV series ended in 1998 but I recently happened on a Wishbone bookmark when I was cleaning out some old teaching resources. Of course I kept it! Penny-pinching creative teachers like me and probably you, too, know that even old teaching resources can be put to new uses. What’s my new use for the Wishbone bookmark, the little teaching tool made of nothing more than a slim strip of cardstock? Wishbone’s job is to introduce another bookmark that I’ve designed, one that says Thank You in different languages of the world. A good match, don’t you think? Afterall, Wishbone the dog has traveled the world finding new adventures. I am happy to tell you that my bookmark, made of nothing more than a strip of bright green copy paper with a bit of writing printed in black ink, has been a winner with every child that has received it. To my delight students in elementary grades 2 – 5 are fascinated with the ways that the words Thank You are written and pronounced in multiple tongues. The power of my bookmark to wow kids isn’t limited to teaching a few words in the languages mentioned above. The simple act of gifting children with this prized teaching tool is that it opens the door for students to share words in other languages too. With their multi-lingual bookmarks in hand, students spontaneously tell about people in their families who come from or have traveled to different countries. My classes have heard their own classmates speak languages including Arabic, Farsi, Hindi, Chinese, Japanese, Phillipino, Russian, Slavic and African dialects. All I did was open the door. I think that my bookmark’s most special power is that it takes children on a little world tour without them ever leaving the classroom. I usually distribute my bookmark on the last day I work with a class. At the bottom of the bookmark are the words Thank You in English. I tell my students that those words express my appreciation for the opportunity to be with them. If you need a bookmark’s power to wow kids in Kindergarten and first grade, try another simple trick. Cut strips of multi-color copy paper or cardstock and invite children to color their own bookmarks. 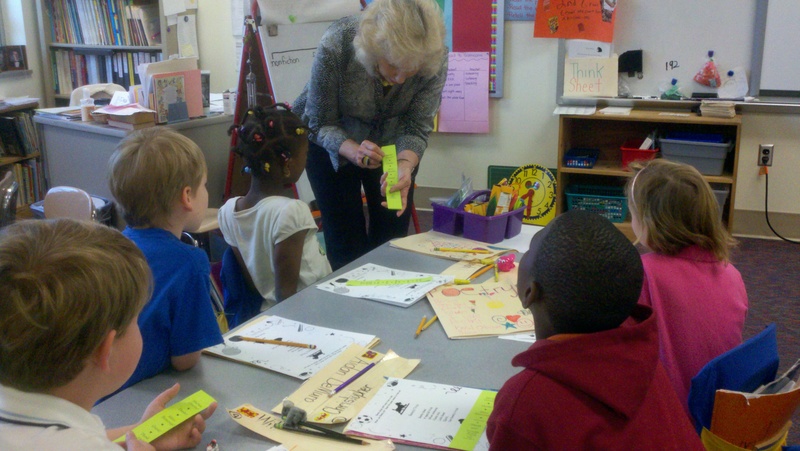 I usually offer some suggestions as I let K – 1 children choose a bookmark by color. “Write your name down the bookmark like this,” I show them. “Copy this” I say, as I write on the board I ♥ Books. It’s amazing to me how much power a single strip of paper can have in the hands of elementary school teachers and students. 3 Pings/Trackbacks for "A Bookmark’s Power to Wow Kids"